Exactly one month ago the Islamic Art Week started in London, with the traditional auctions at Bonhams (Oct 6th), Sotheby’s (Oct 7th) and Christie’s (Oct 8th and 9th). Coming from a strictly academic background, I have never been much interested in the auction world as a whole but as I have already said and repeat here, the art market is quite important: it traces trends and tastes. That’s why I started following the Islamic Art auctions. Following the art auctions for a certain period, it is also possible to understand how the interest of collectors and museums has changed and will change. Unfortunately it is too early for me to foresee anything (having started last year following the auctions), still, I find it informative to have a look at how the Islamic Art Week went this year. 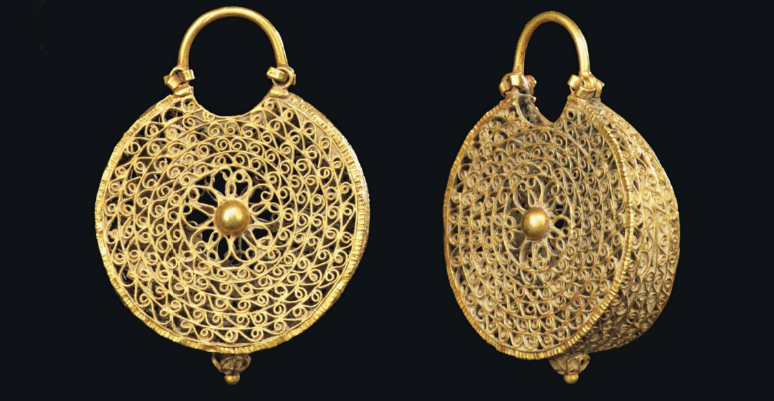 A pair of Fatimid gold earrings. Egypt, second half 11th century. Christie’s (Oct 8th), lot 9. The number of lots listed in the four catalogues by the three auction houses was 1065 and among them the great majority can be considered to be Islamic Art. The fact is that in these auctions both Islamic and Indian objects are sold (maybe the taste for the exotic still latent in Europe tends to assimilate the two, but this is another story). Also, some objects produced in Europe for the Islamic market or produced in the Islamic world for the European market are handled in the very same auctions. This can make things harder. 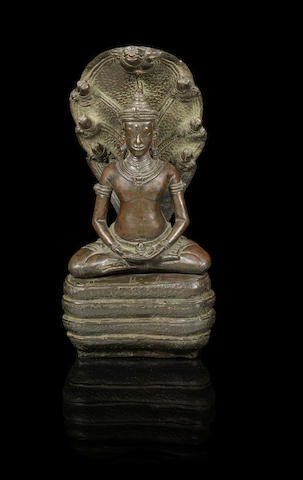 A Khmer bronze seated figure of Buddha Muchalinda. Cambodia, late 12th/ early 13th century. Bonhams, lot 98. In any case, of the 1065 lots on sale only 125 can be considered as ‘not Islamic’, which means that they have nothing to do with the Islamic World (for instance a Buddha statue from Cambodia in Bonhams’s catalogue). The 57% of lots was actually sold: this means that 575 in total were bought. Of these, 75 were ‘not Islamic’ (if you are asking yourself what happened to the Buddha statue, it was sold). In other words, the 13% of lots sold during the Islamic Art Week were not of strictly Islamic origins. For someone, anyway, the most interesting part of auctions is the realised prices. I do not like giving a price to objects I would prefer to study, still, the highest sold price reached £ 962,500: it is a wooden tray with mother-of-pearl decorations, lot n. 102, Bonhams. The lowest realised price was instead £625. 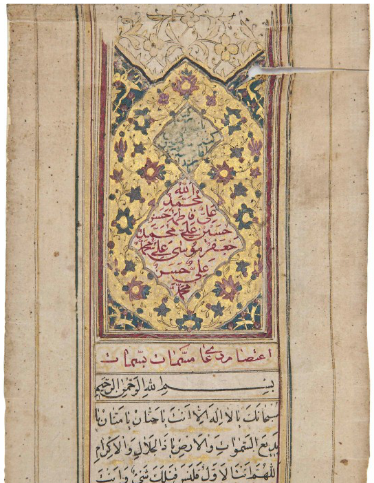 This same price was paid at the Christie’s auction, held Oct 9th for four objects: an Indian rosewood ivory-inlaid document holder dated to 19th century (lot 90), a prayer scroll from Qajar Iran (lot 278), a Hajj certificate from 20th-century Mecca (lot 385) and the volume Mon voyage a la mosque by Jules Gervais-Courtellemont, printed in Paris and dated 1897 (lot 393). A Shi’a prayer scroll. Qajar Iran, dated AH 1240/1824-25 AD. Christie’s (Oct 9th), lot 278. The facts & figures of this year auctions are quite different from those of Fall 2014. Back then three auction houses sold 807 lots in total. This is the main difference that can be noticed between the two auction weeks, the highest and lowest prices realized being nearly the same. The origins of the objects are in line with what expected (at least what I expected). Lots Turkey and the lands of the Ottoman Empire, India and Great Persia outnumber by far the objects from other Arab-Islamic countries, as shown. Also, much like last year, the majority of lots are dated between the 18th and early 20th century… nothing new under the sun. Thus, nothing new under the sun in this regard. Too early to draw any conclusion from this, of course. But the art market can be a mirror not only of tastes and trends, but also of the cultural-political situation that revolves around the Islamic art. McQuillian and Lucey in their article “The Validity of Islamic Art as an Investment” explain how politics and particular events seem to have affected the art market of Islamic Art, they refer for instance to the 9/11 or USA engaging war in Iraq, but also the oil price. In their explanation everything seems interconnected, and probably it is. Maybe we can read the drop of sold lots from Fall 2014 and Fall 2015 as a result of the current instability in the Near East, with the Syrian crisis, the tensions in Palestine and ISIS issue. The following auctions and Islamic Art weeks will give us more details and figures to discuss about, and to proof if this drop is purely accidental or if the reasons behind it are to be found in the political unrest in the region. Last year auctions: go to the article. 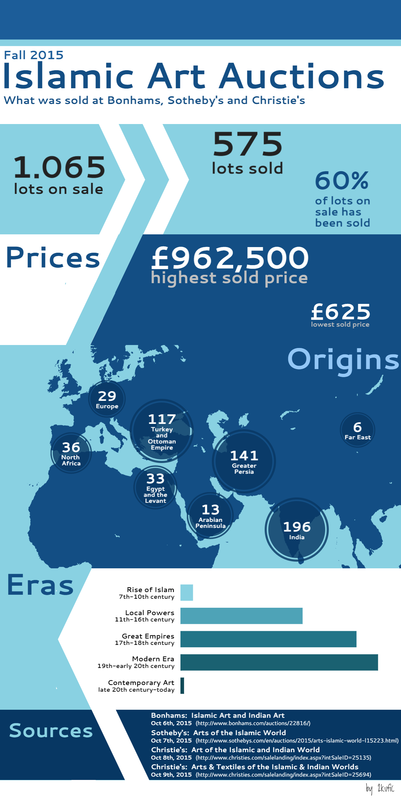 The infographic of the auctions of Islamic art is available here.